This year, I’ve been teaching public policy analysis in continuing education (diploma) courses at CIDE. This is a nice (and refreshing) change from undergraduate and graduate teaching because it forces me to design simpler ways to teach people who already have their degrees and who need “just an upgrading/refresh crash course”. It is, however, a big challenge because it also forces me to find readings that will be simple and readable enough for the participants. Call it personal bias, but I usually teach public policy theories and public policy analysis with work by Tanya Heikkila, Chris Weible, Paul Cairney, Michael Howlett, Kathryn Harrison, etc. This is quite normal, given that my PhD training in political science and public policy was in Canada, and thus I’m very familiar with the US, English and Canadian literatures. I’m slowly getting myself more acquainted with the Mexican literature, as well. For my lecture on institutional analysis I relied on Cairney’s book chapter from his book “Understanding Public Policy: Theories and Issues“. 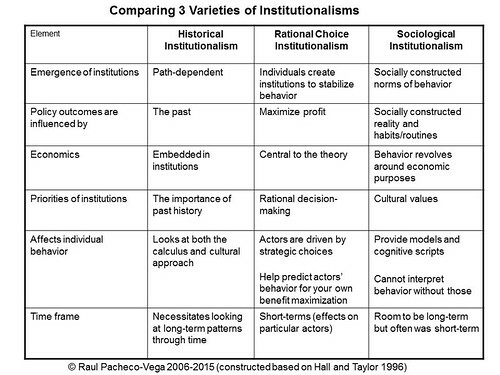 I also relied on my colleague Mauricio Merino Huerta’s paper on the importance of routines, and on a table I created based on the Hall and Taylor 1996 classic on political science and the 3 varieties of neoinstitutionalisms. I found Paul Cairney’s summaries of theories in 1000 words extremely useful, and I strongly recommend it for teaching purposes.